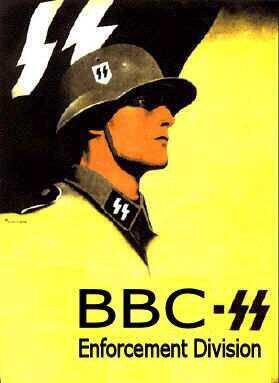 More and more we are witnessing individuals standing up to the power of the BBC, an organisation which sadly remains backed by the full force of despicable state criminal prosecution powers to protect its income stream. This week, a householder was subjected to a bizarre search warrant of his home by two BBC TV Licensing Capita employees accompanied by two police officers. The entire incident was (wisely) videoed by the householder. The full background story and transcript are featured on the TV Licensing Blog pages here: http://tv-licensing.blogspot.co.uk/2014/07/bizarre-tv-licensing-search-warrant.html. The video clearly shows that at the time of the inspection, the householder’s TV was neither plugged into power or an antenna socket. Obviously this on its own would render the TV incapable of receiving any live TV signal. Even if the TV was tuned (and there was no evidence on the video to suggest that it was) without either power or antenna feed connected, the TV would not be installed and therefore could not be used to receive live TV broadcasts. It is a simple matter of evidential fact (the video) that this householder’s TV could not be said to be ‘installed’ within the meaning of section 363 of the Communications Act 2003. Unable to secure evidence of a TV receiver installed or used at the point the search warrant was executed, that should have been the end of the matter. However, at video timecode 4:25, a very disturbing development occurs. The BBC TV Licensing Capita employee, understood to be a Mr. Phillip Carvill, plugged the TV into a power and aerial source. He has taken what can only be described as the first steps to installing the TV to receive a live broadcast. It is very obvious viewing the video that it was the BBC TV Licensing Capita employee, and not the householder, that plugged the TV into the power and aerial signal source. In particular, by plugging in the TV aerial, the BBC TV Licensing Capita employee is taking steps which would render the perfectly lawful state of the equipment (unable to receive a live broadcast) at the time of the start of the search warrant to potentially become unlawful under section 363 of the Communications Act 2003. It cannot be part of any reasonable test of TV receiving equipment, that the BBC or its contracted agents (Capita) are permitted to alter the receiving configuration of a householder’s TV such that it could receive a live broadcast when previously it could not. To so alter the receiving configuration would amount to the fabrication of evidence as found at the scene. Fabrication of evidence during the course of an investigation is a criminal offence at common law which is known as attempting to pervert the course of justice. It is obvious that a TV radio receiver will not receive a live broadcast without being plugged in to an aerial. As a matter of evidence, the only way an offence occurs under section 363 of the Communications Act 2003 is if television receiving equipment is installed or used to receive live broadcasts. This was plainly not the case here as the evidence of the householder’s video clearly demonstrates. Unable to secure evidence of the householder watching live TV (and bizarrely seemingly unable to test a modern TV which they were employed to do) the BBC Capita employees turn to claiming a trumped up ‘obstruction’ charge against the householder. This is perhaps the most disturbing development in this video. Firstly, the BBC TV Licensing Capita employees are the ones responsible for doing the test of TV receiving equipment, not the householder. A householder’s only duty is to give reasonable assistance to permit those executing the warrant to ‘carry out their examination or test’. It is plainly not reasonable to assist BBC TV Licensing Capita employees to render the lawful state of a householder’s equipment unlawful so as to be in contravention of section 363 of the Communications Act 2003. That the BBC TV Licensing Capita employees appeared to claim a lack of technical expertise to carry out their ‘test’ is totally absurd. This is a matter of training for BBC TV Licensing Capita staff and not a matter for the householder. Secondly, the matter of there being an ‘obstruction of the warrant’ by not confirming or answering questions at interview is without any procedural or legal foundation. An interview under caution is given under PACE with a proscribed warning that starts “You do not have to say anything….”. The legal right in English law to remain silent is a long standing principle. It therefore cannot be said to be ‘obstruction of the warrant’ to refuse to answer questions in connection with an interview under caution. To suggest otherwise is utterly preposterous and just plain legally wrong. It is obvious for all to see that the TV Licensing enforcement decends into legal farce once a householder has sufficent knowledge about their rights and decides to stand up to the BBC TV Licensing Capita bullies. It remains to be seen if BBC aka TV Licensing Capita will have the temerity to put an obstruction charge before magistrates with all of the attendant procedural and evidential questions that have been rasied by this despicable and disturbing video. The sooner the BBC and its wholly owned sock-puppet “TV Licensing” and its diabolical enforcement (read: enfarcement) process are put out the UK public’s misery the better. I’m sure one day the licensing folk will turn up at my door. They keep sending me letters asking me to confirm that I ‘still’ no longer need a TV license. Pretty sure they don’t believe me. Is it not the case that BBC/Capita operatives in the course of exercising a search under warrant can legally issue a PACE caution? Given it is, the householder in the video might have been better served acknowledging the caution rather than claiming not to understand it and refusing to have it explained (which latter may contribute to the notion that he was obstructing). He then might have confined all his responses to saying “no comment” rather than make remarks that contributed information and volunteered his opinion and perhaps harmed his case.